We're super happy to announce to you that we've implemented the Site Import feature. It allows you to import an existing WordPress Site into qSandbox with a few clicks. All you have to do is package your site using the free Duplicator (https://wordpress.org/plugins/duplicator/) plugin. 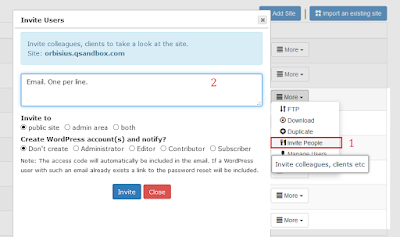 Oh, we've also added a new feature that allows you to invite people to a given test site. The access code is automatically included in the email. Optionally you can chose to have WordPress accounts setup as well. P.S 1. You have probably seen the updates from the last few months which included FTP accounts, more disk storage and much more. P.S 2: Let us know what functionality would you like implemented into a future release of qSandbox.